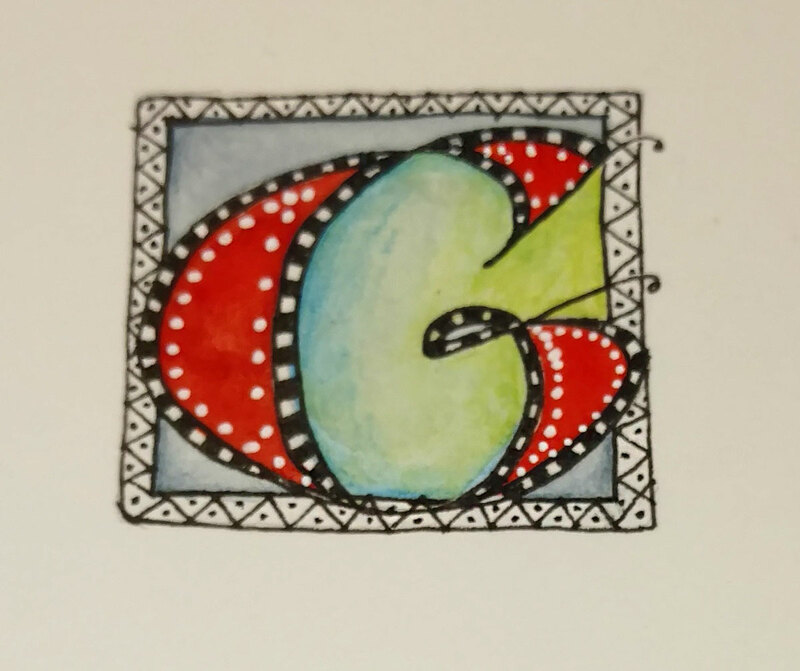 Casual versal “G” illuminated with watercolor pencils and pan watercolors. 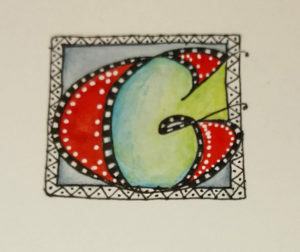 Approximately 1.5″ square. At our local guild meeting on Monday, Diana guided us through the designing and painting of a casual versal letter (or 4, in the case of one participant!). 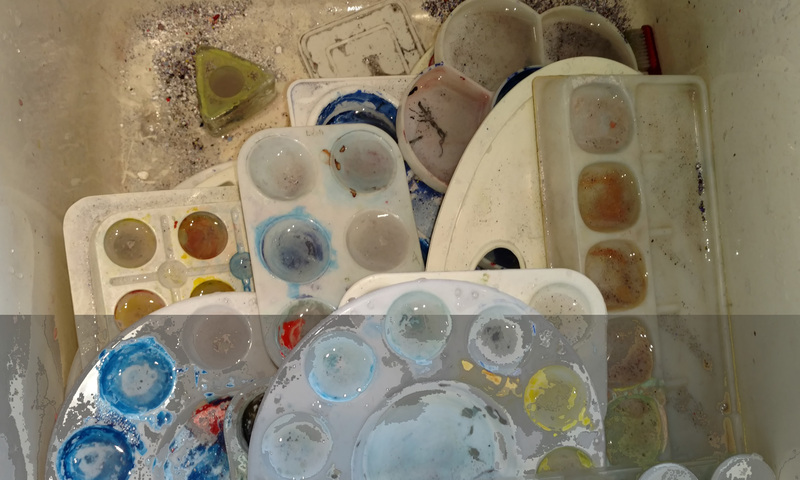 We had a lot of fun with pencil, pen, watercolor, and watercolor pencils. Here’s mine, at left. I began another; perhaps I’ll post it when I finish it. Lots of projects going these days. Addressing styles. 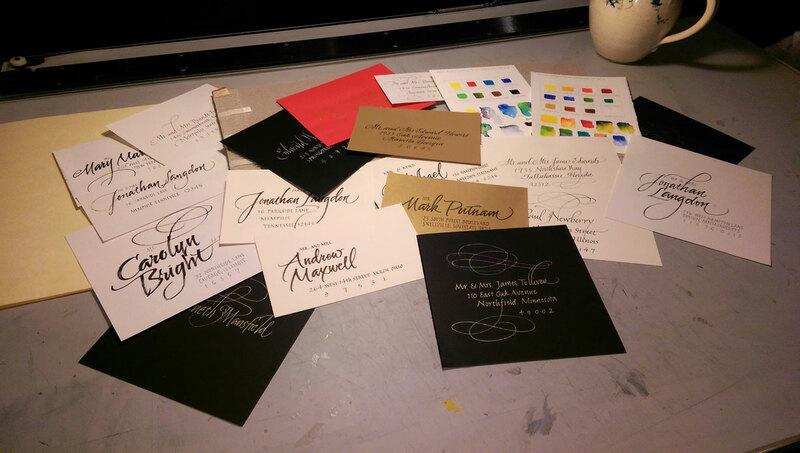 I had the best time addressing some personal envelopes recently and discovered that I don’t really need guidelines for certain styles. So I’ve been developing some more casual envelope address styles. Some of what I tried today is shown above: sumi ink, pigment ink, gold gel pen, and fine marker on white, black and shimmery gold stock. Yesterday I got out two travel watercolor sets and made test cards using a water brush. At the tops of the cards are the pure colors. At the bottoms of the cards I’ve experimented with mixing and tints.